This Digital wireless backup camera system comes pre-configured with our 5-inch dash mounted monitor. It features 2 digital input channels that will allow you to add a 2nd camera and toggle between them even while you drive. Also, the monitor is bright enough for a perfect day time image even with direct sunlight but auto dims at night for a comfortable view in any environment. 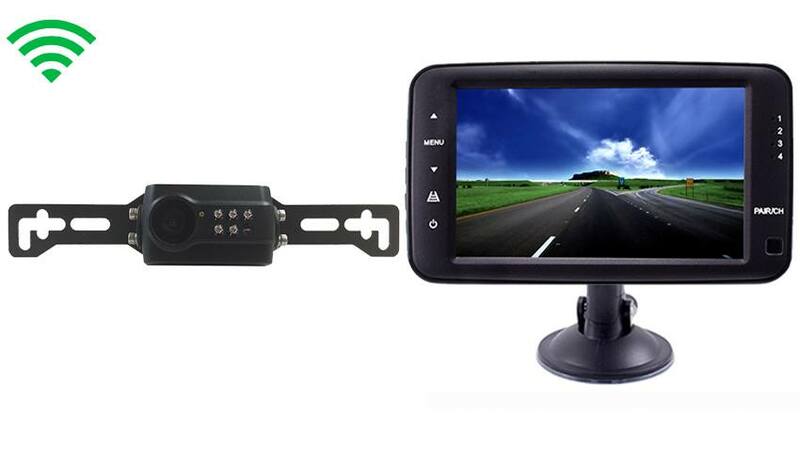 The Wireless License plate backup camera included with this system is digital with a range of 120ft. because it is digital the connection between the camera is encrypted and secured with no chance of interference, even if you add a 2nd camera the reception will be crystal clear even if you are watching it continuously while driving down the road. Keep in mind that though this license plate camera has a HI definition CCD lens we offer an upgrade to that CCD that will give you a faster refresh rate and enhanced night vision, this upgrade like all the others can be found in the top right of the page. The viewable angle is 120 degrees which is standard but if you want to see 3 full lanes you might consider upgrading to our 170 degree lens. These upgrades and more can be done by using the customize and upgrade section at the right of the page. 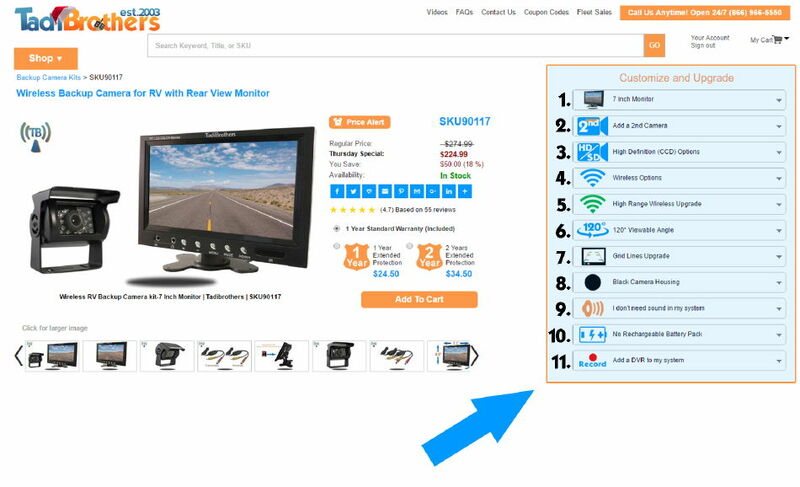 Please note, you can upgrade this system to include a License plate backup camera and monitor display size by looking at our “customize and upgrade” section at the top right of the page. For more information about our different cameras, click here to see our License Plate Backup Camera Guide. Put any compatibility issues aside. With the TadiBrothers promise, you have our 30 day guarantee to return the item for an exchange or a full refund. "This digital monitor is insane, at first I was worried thinking it might be too small but 5 inch did just the trick. I actually have been paired with two cameras one license camera and one RV camera for the back of my trailer. The installation was very very simple I just connected the camera to the 12 V in the motor to the 12 V and I was done though I got instructions preparing me to pair the two cameras for some reason they were already paired out of the box. I guess Tadibrothers pairs them in their factory. " " I needed a monitor that would be easily transferable between my two trucks for when we pull our horse trailer. This monitor was exactly what I needed it has four channels so I can have one camera on each truck or have cameras on my trailers and try to change between the vehicles. I strongly recommend getting this monitor because it comes with four channels. I wish it was split screen but I guess that something I could’ve upgraded to on the website. It also came with the cigarette adapter which was a nice bonus. All in all this is a nice monitor. " "I recently purchased an Camper that had a back up camera on the back of it however the monitor stayed in the previous owners truck. In my attempts to find a manner that works I called Tadibrothers they asked me to text them a few pictures and they came up with this monitor here I wasn’t really sure he was going to work but the professionals on the phone or courteous and promised me that if it doesn’t I can send it back for a full refund but they have done this before and they knew it would work. This weekend I installed it and like they promised it worked perfectly. They even texted me a video of how to pair the camera to the monitor. I thought that was a very neat thing for them to do and shows a level of ingenuity that isn’t seen much these days. As a former engineer I am not easily impressed but Tadibrothers has impressed me. I only wish I splurged and got the 9 inch monitor. But maybe for the next vehicle I’m happy with this manner and I won’t change you for anything. Keep it up Tadibrothers! " " My wife got tired of me yelling at her when we’re backing up so she got me this monitor and I hoped it up with a license plate camera. I upgraded to the one that has audio now we can speak and I hear and we’re all good. Tadibrothers single-handedly save my marriage thank you Tadibrothers keep up the good work my wife thanks you "